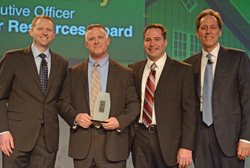 The Eye on Biodiesel Impact Award was presented to Richard Corey, California Clean Air Resources Board during this morning’s general session. The State of California continues to serve as a national and world leader in regulations related to environmental sustainability, and the California Air Resources Board is at the heart of those efforts. In January of 2010, Air Resources Board staff successfully implemented the first ever market-oriented carbon reduction policy for transportation fuels, a policy known as the Low Carbon Fuel Standard. Since that time, use and production of biodiesel and other renewable fuels has increased significantly. Californians have since enjoyed the benefits of cleaner air, growth in green jobs, and increased fuel diversity.